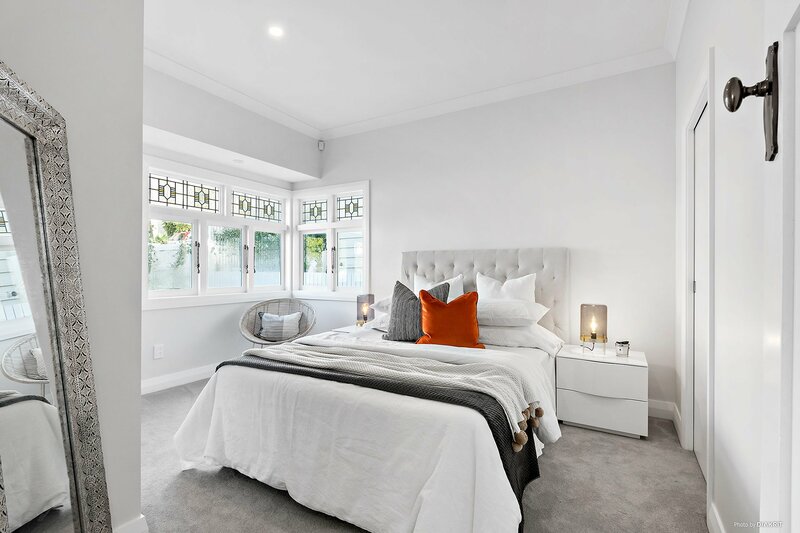 When builder John Kearney and his partner, Lindsey Bradfield, decided to renovate their own home, they certainly didn’t anticipate having to rebuild their entire house. 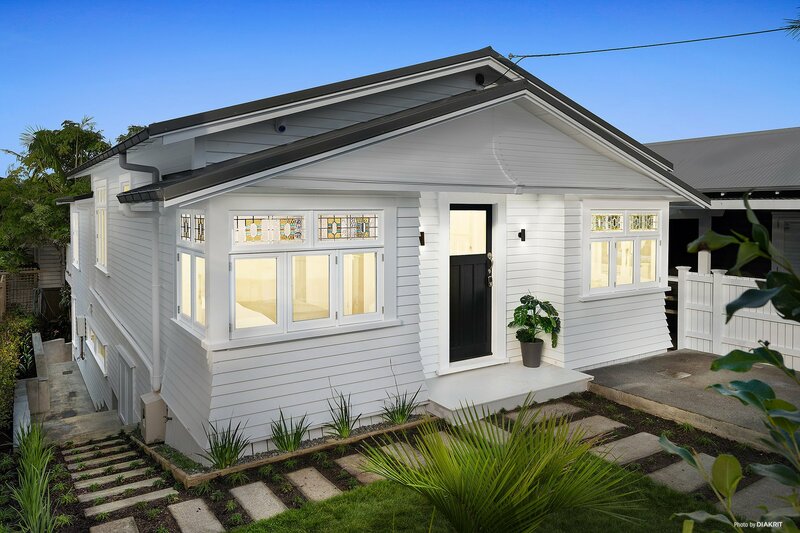 Unaware of what surprises were hiding behind the facade of the 1920’s Californian Bungalow in Herne Bay, they quickly realised that patience was the key to a successful heritage renovation. And, some 18 months later and a few bumps along the way, they managed to successfully transform their run down bungalow into a stylish, modern abode that blends the character of the old with the sophistication of the new. John and Lindsey engaged architect Greg Jones and Interior Designer Janey Larsen to help turn their vision into reality. The site was a tricky one to work with so it was essential that they had a skilled team behind them, but more importantly, a team that would help create a versatile space whilst maintaining the character of the heritage façade. The façade of the house was moved back to accommodate an off-street car park while the entire rear of the home was demolished and re-built. The discovery of rotten floor boards meant that what was initially meant to be a renovation, ended up being a complete new build however, they were lucky enough to keep the original stained glass windows which were re-sashed along with the curved bell of the house. It didn’t help that recent wet weather caused even further delays too. The stained glass windows are the only remaining original features of the house. However despite these setbacks, John and Lindsey chose to embrace the challenges and although unexpected, now benefit from a fully modernised interior. When it came to creating an outdoor living space, it was important that John and Lindsey had a space that would provide year round living and entertaining. Part of this decision included the installation of an outdoor gas fireplace that would provide comfort throughout the colder winter months and create an extension of the indoor living area too. Lindsey explains “The fireplace throws out a lot of heat, and when the sliding doors are open, it heats into the house too”. Escea’s EF5000 outdoor gas fireplace provides year round comfort for entertaining outdoors. Because their hot water was already connected to gas, it was an easy choice to go with a gas fireplace rather than a wood fire. Plus, living in the city meant that it was a more convenient option so they didn’t have to worry about the mess, time and admin of burning wood. 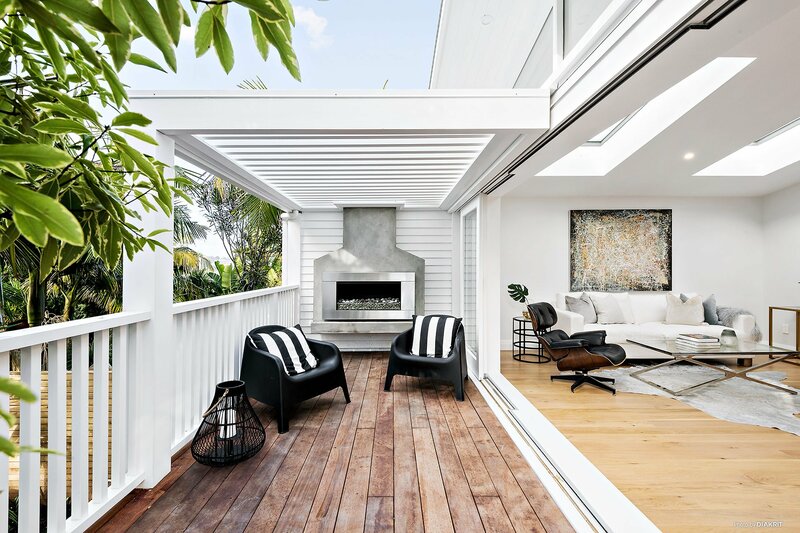 The fire surround was plastered in concrete which adds interest against the white weatherboards and although the outdoor gas fireplace doesn’t technically require a flue, the surround creates a focal structure for guests to gravitate towards and mingle around. Lastly, they installed a Louvretec opening roof which allows the space to be used year round, providing shelter from Auckland’s tropical rain and shade from the sun in the height of summer. Lindsey’s favourite part of the home is the aspect and tropical outlook from the open plan living area. Although the building process wasn’t smooth sailing, the home speaks to its homeowners and its surroundings. “The open plan upstairs living area is my favourite part of the home. I love the tropical green outlook from the big sliding glass doors” explains Lindsey. 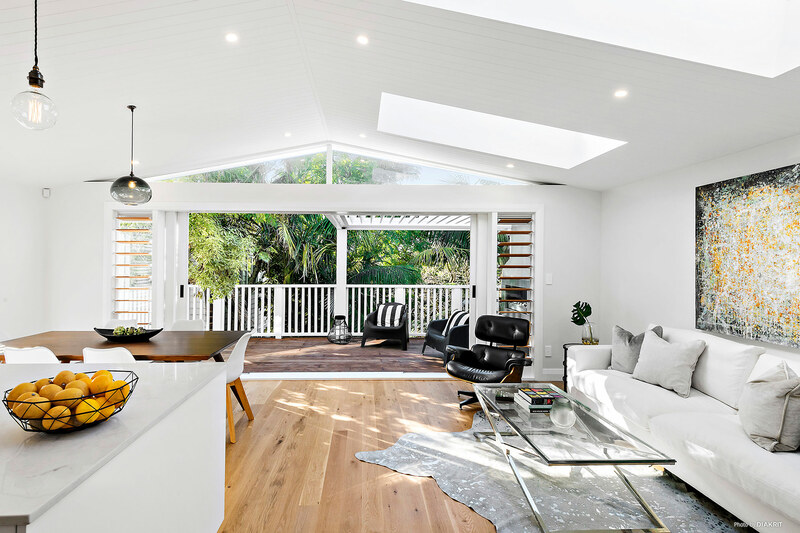 Despite the budget blowout, John and Lindsey have created a beautifully considered home that seamlessly blends the heritage façade with a modern rebuild, ready for entertaining no matter what Auckland’s weather decides to do.